I hope everybody had a great Thanksgiving with family & friends and are now getting into the holiday spirit by decorating trees and reading Dickens! I am busy preparing for my shows at Venue Theatre and The Strand Bookstore which are just days away. I have also been creating some very special holiday items that are available for a limited time only at my shows and at StandUpLibrarianDesigns.com. 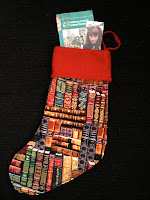 Why hang a store-bought Christmas stocking when you can have a personalized book stocking to encourage reading! I hope all of you will have a chance to come to one of the shows because it is truly a celebration for me and I am going all out. I started performing stand-up comedy in NYC back in 2002 so to return and perform my all-literary comedy act at The Strand Bookstore is such an honor. Plus to perform in my hometown for the first time in ten years is pretty cool too. Nothing makes me prouder than writing jokes that hopefully people enjoy but more importantly encourages them to read! The show info is below…hope to see you there! You’ve seen stand-up, but not like this! 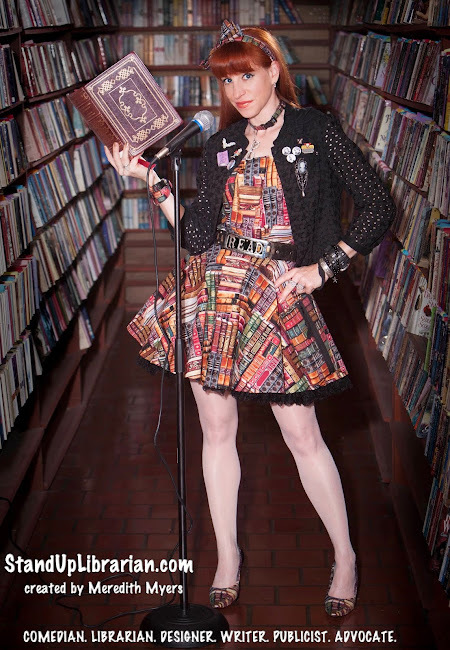 Comedian/Librarian Meredith Myers will perform an hour of hilarious literary entertainment for all ages as she riffs on pop culture icons, authors, story time, and books, books, books. A combination of Pippi Longstocking and Sandra Bernhard with the style of Carrie Bradshaw, Myers entertains while educates about the importance of literacy and libraries as she addresses Melvil Dewey and the Dewey Decimal System, honors Edgar Allan Poe in a rock n’ roll musical parody, and dances on a book cart in a delicious holiday-inspired musical number all in literary costumes she sews herself! There will most certainly be no shushing at this show! For reservations, call 727-822-6194. Cash only. 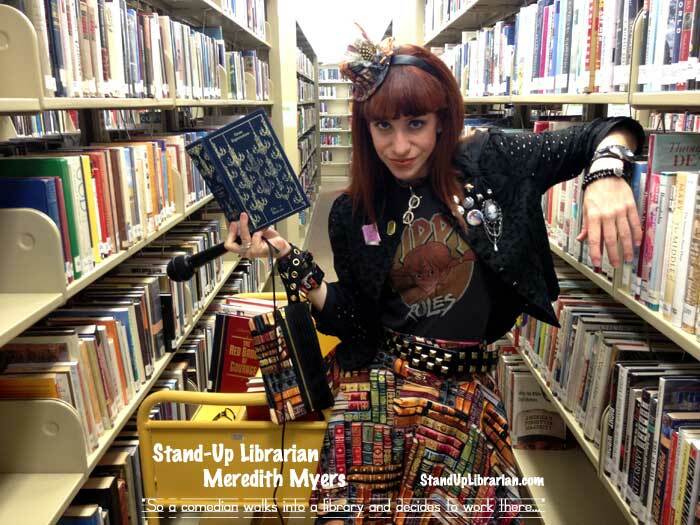 Meredith Myers has a Masters degree in Library and Information Sciences from the University of South Florida and has been performing stand-up comedy across the country since 2002 after checking out a comedy book from her local library. She wrote, produced and starred in her one-woman show Like a Publicist off-off Broadway in 2003, which received rave reviews and was based on her years working in public relations for celebrities Hugh Jackman and Jeremy Renner to Diana Krall and Whitney Houston. Binding her experiences in comedy and libraries, Meredith created www.StandUpLibrarian.com in June of 2010 to educate and entertain people about the importance of libraries and literacy. In 2012, she launched www.StandUpLibrarianDesigns.com so she would have something literary fabulous to wear! She currently lives in St. Petersburg and performs at library and book events across the country. 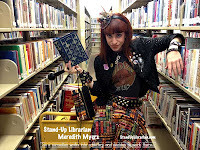 For press inquires and additional information on Stand-Up Librarian Meredith Myers, contact Meredith via email at StandUpLibrarianMM@gmail.com or visit StandUpLibrarian.com. Oh and because I am a librarian, I wanted to share with you the ‘Thanksgiving poem’ Over the River and Through the Wood by Lydia Maria Child. Did you know it was a poem before it became a song? Of course you did! Well, I’m glad I didn’t try to shock you with a video about it then. Anyway, HAPPY THANKSGIVING everybody! NEW YORK, NY (November 15, 2012) – “So a comedian walks into a library and decides to work there…” Comedian/Librarian Meredith Myers, also known as The Stand-Up Librarian, brings her all-literary comedy show to The Strand Book Store on December 6th. The event begins at 7pm and the purchase of a $10 Strand gift card is required to attend. You’ve seen stand-up, but not like this! Myers will perform an hour of hilarious literary entertainment for all ages as she riffs on pop culture icons, authors, story time, and books, books, books. A combination of Pippi Longstocking and Sandra Bernhard with the wardrobe of Carrie Bradshaw, Myers entertains while educates about the importance of literacy and libraries as she addresses Melvil Dewey and the Dewey Decimal System, honors Edgar Allan Poe in a rock n’ roll musical parody, and dances on a book cart to Madonna, all in literary costumes she sews herself! There will most certainly be no shushing at this show. Myers has a Masters degree in Library and Information Sciences and has been performing stand-up comedy across the country since 2002 after checking out a comedy book from her local library. She wrote, produced and starred in her one-woman show Like a Publicist off-off Broadway in 2003, which received rave reviews and was based on her years working in public relations for celebrities Hugh Jackman and Jeremy Renner to Diana Krall and Whitney Houston. Binding her experiences in comedy and libraries, Meredith created StandUpLibrarian.com in June of 2010 to educate and entertain people about the importance of libraries and literacy. 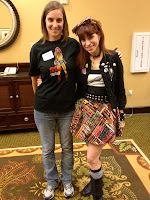 In 2012, she launched StandUpLibrarianDesigns.com so she would have something literary fabulous to wear! Her literary purses are carried by The Strand and are available for purchase at the show. Myers currently lives in St. Petersburg, FL and performs at library and book events across the country. This event will be located in the Strand's 3rd floor Rare Book Room at 828 Broadway at 12th Street. The purchase of a $10 Strand gift card is required to attend and may be used at any time, towards any purchase at the Strand. Members of the press with media-related inquiries about The Strand or this event can be sent to events@strandbooks.com or by calling 212-473-1452. 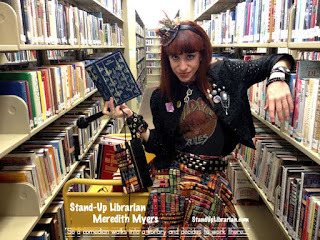 For press inquires and additional information about Stand-Up Librarian Meredith Myers, contact Meredith at 347-979-SHHH, via email at StandUpLibrarianMM@gmail.com or visit StandUpLibrarian.com. Stand-Up Librarian at Venue Theatre: 11/30 & 12/1! ST. PETERSBURG, FL (November 13, 2012) – “So a comedian walks into a library and decides to work there…” St. Petersburg native Meredith Myers, also known as The Stand-Up Librarian, brings her all-literary comedy show to Venue Theatre on November 30th and December 1st. Show times are 8pm and ticket prices only $15. You’ve seen stand-up, but not like this! Myers will perform an hour of literary entertainment for all ages as she riffs on pop culture icons, authors, story time, and books, books, books. A combination of Pippi Longstocking and Sandra Bernhard with the wardrobe of Carrie Bradshaw, Myers entertains while educates about the importance of literacy and libraries as she addresses Melvil Dewey and the Dewey Decimal System, honors Edgar Allan Poe in a rock n’ roll musical parody, and dances on a book cart to Madonna, all in literary costumes she sews herself. There will most certainly be no shushing at this show! Myers has a Masters degree in Library and Information Sciences from the University of South Florida and has been performing stand-up comedy across the country since 2002 after checking out a comedy book from her local library. She wrote, produced and starred in her one-woman show Like a Publicist off-off Broadway in 2003, which received rave reviews and was based on her years working in public relations for celebrities including Hugh Jackman and Jeremy Renner to Diana Krall and Whitney Houston. Binding her experiences in comedy and libraries, Meredith created www.StandUpLibrarian.com in June of 2010 to educate and entertain people about the importance of libraries and literacy. 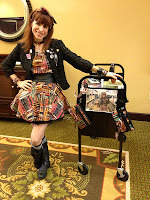 In 2012, she launched www.StandUpLibrarianDesigns.com so she would have something literary fabulous to wear! She currently lives in St. Petersburg and performs at library and book events across the country. Venue Theatre is located at 9125 US Hwy 19 N at Mainlands Blvd in Pinellas Park. 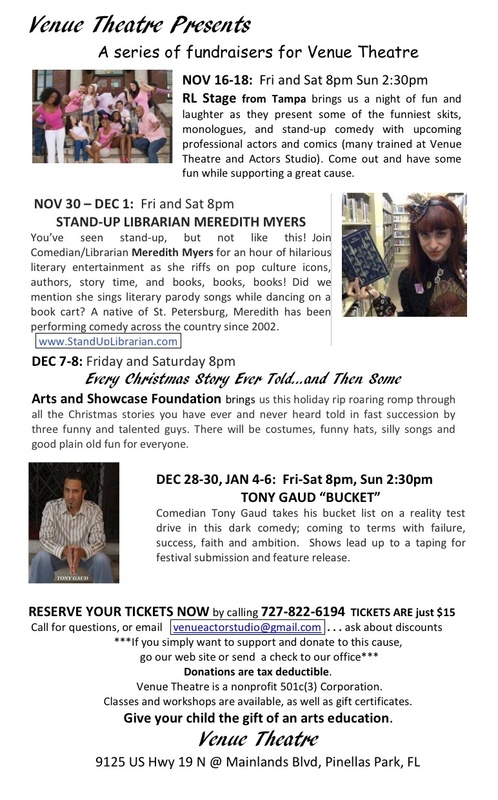 For press inquires and additional information on Stand-Up Librarian Meredith Myers, contact: Meredith Myers at 347-979-SHHH, via email at StandUpLibrarianMM@gmail.com, or visit StandUpLibrarian.com. On Friday, November 2, 2012, I was the lunchtime entertainment for the Tampa Bay Library Consortium’s Annual Meeting. I had never performed for a lunch before and the thought of competing with tossed salad and grilled chicken made me slightly uneasy, not to mention extremely hungry since I normally don’t eat before performances due to the fear of vomiting on my audiences out of sheer nervousness. Plus you never really know if a person is red in the face due to the hilarity of your story time joke or because they are actually choking on a sliver of bone and need help. I was also performing for most of libraries I had applied to work for at one time or another so the performance also felt like sort of an audition/job interview, which really makes things tough either way because when you are looking to get hired, you can’t really make fun of anybody and secretly that’s what people really want from comics – to say the things that everybody else is thinking & humiliate the jerks in the room. For example, before I went on, a librarian came over and said that she wished I knew more of the personalities in the audience because if I could ‘roast them,’ that would have made her day. I didn’t want to admit that I had my own list of people to roast – all across America - but due to having something called integrity and respect for myself, I wasn’t going to share any of my precious stage time talking about those sad individuals. Besides, I am writing a book and wouldn’t it be better to save those juicy details for “The Today Show” interview with Matt Lauer? Anyway, I also had the date of November 2nd hanging over my head reminding me that it was exactly a year ago that my life would take a giant U-turn thanks to an article in the LA Times. People who say there is no such thing as bad press aren’t trying to get a job in the very competitive and highly conservative library field. Think you have an incredible resume? Excellent references? Make a great impression on job interviews? None of that matters when there is a full-page story about you in one of the top papers in the country to create doubt in your abilities and intentions…to the entire industry! At the end of the hour-long performance, I couldn’t help but to shed a tear. I was so happy to be still standing at the microphone regardless of the obstacles put in my way. To look out at an audience full of the librarians I long admired, most smiling and clapping, gave me hope that my unusual path, while always in development and exploration, unpaved and rugged, was always full of inspiration and adventure! 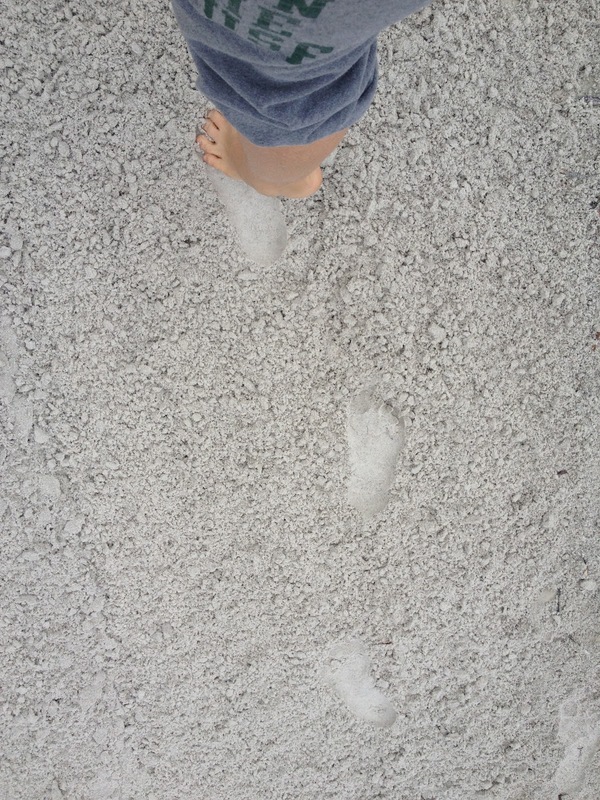 It has been an incredible year of self-discovery and creativity for me in so many ways. Launching Stand-Up Librarian Designs and sewing literary purses, constructing fun literary costumes with matching hats and headbands has absolutely been one of the highlights of this year. A hobby I once gave up on, I decided to try once again and as a result, has found an audience of patrons who purchase them. It still makes me laugh that I actually make my own outfits and have a merchandise stand full of things I created! 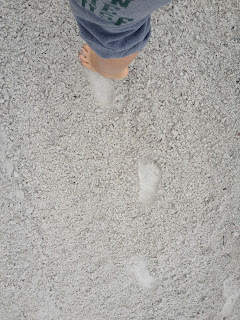 Now that is cool. I cannot thank the TBLC enough for showing their support to me on such a day that sparked so many memories and allowed me to triumph! 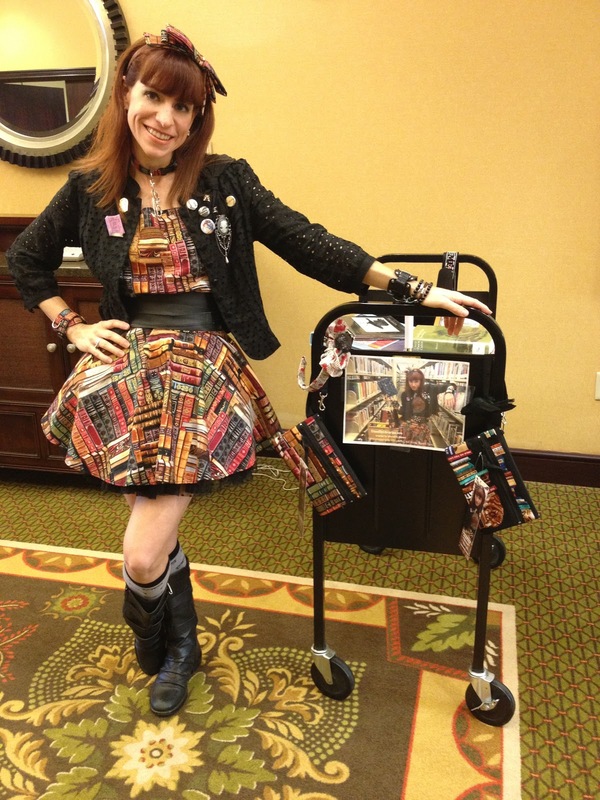 Standing with my book cart before the show. Performing literary jokes for the TBLC. With Jessica Riggins of the TBLC. Working at my merchandise stand.